Tracers are applied to piping and equipment to maintain, raise or lower a temperature. Usually, tracers are used to maintain hot temperatures, although they can be effective in maintaining cold temperatures. They are commonly used to provide freeze protection on pipelines, instruments and process systems. Experience in the field indicates that many traced systems are installed without thermal conducting cements, also known as HTM (heat-transfer medium). Engineers and designers may not be familiar with the advantages of HTM and therefore don’t consider it in their design criteria. HTM use on both steam and other heat medium tracer systems can be cost effective. This is especially true where elevated temperatures must be maintained. HTM can be applied to certain electric tracer cables to improve performance. The following are reasons to apply HTM. 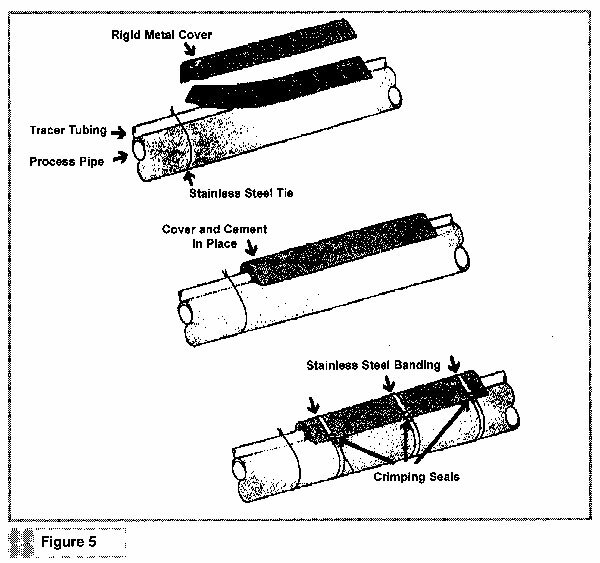 Improved heat transfer can reduce the number of tracers on a pipe. A single tracer with HTM may transfer more heat than three or four bare tracers. It can reduce the number and size of plate coils on equipment. It can maintain accurate and predictable process temperatures. It’s easy to apply and maintain. The heat-up time of a process can be shortened. It can conserve energy (heat is directed to the where it’s required). It may eliminate the need for a jacketed pipe system. It may eliminate a corrosive condition at the tracer and substrate interface surface. It should be noted that any traced system will only perform as designed, when the insulation system remains dry at all times. The insulation system and materials must be selected to withstand the highest or lower temperature, which in this application is the temperature of the tracer. 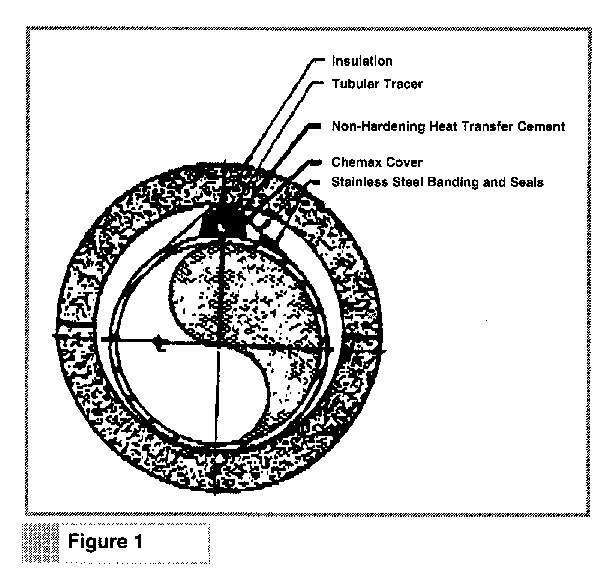 When the heat loss is determined, allow for oversized insulation to accommodate the tracer (See Figure 1). This cement is hardening, inorganic based and can be used at temperatures as high as 1,250 degrees F (677 degrees C). They’re fire resistant in that they will not burn or support combustion. They’re equally applicable to heating, cooling or dual-temperature systems. The binder is soluble in water before curing and must be protected from moisture. After these cements are exposed at any (tracer) temperature above 450 degrees F (232 degrees C) they will become waterproof and will not absorb moisture. The cement is self-curing by air-drying for 48 hours or by passing hot water (maximum 200 degrees F) through tracer for four to 12 hours, eliminating moisture in the cement. The cement will bond to the substrate with a strength of between 200 lbs. and 250 lbs./sq. in. There’s no deterioration due to aging or reduction in efficiency. The cements can be applied at a minimum temperature of 32 degrees F (0 degrees C). The cements have an excellent (high) thermal conductivity ‘k’ factor. This will vary by the mean temperature. The application of this cement is done by hand or trowel. These cements should be applied to a rust-free surface. There are generally two classifications of hardening cements in this category. The maximum/minimum temperature range is between 750 degrees F and minus 300 degrees F (400 degrees C to minus 182 degrees C). The thermal conductivity is 90 Btu in/hr/sq. ft/degree F. The U Range is between 20 and 40 Btu /hr/sq. ft/ degree F. This material is considered the general purpose cement. The maximum/minimum temperature range is between 1,250 degrees F and minus 300 degrees F (677 degrees C to minus 182 degrees C). The thermal conductivity is 70 Btu in/hr/sq. ft/degree F. The U Range is between 20 and 40 Btu/hr/sq. ft/degree F. This material is considered for high temperature applications. They can be used at temperatures as high as 400 degrees F (205 degrees C). They’re non-soluble and therefore no protection from moisture is required. No curing or drying time is required for these cements. These cements can be applied to a rusty or corroded surface, though this isn’t recommended until the seriousness of the external corrosion is evaluated. They’re easily applied with a trowel or spreader. They’re recommended where expansion and contraction cycles are expected. The minimum application temperature is 5 degrees F (minus 15 degrees C). They have an indefinite shelf life. These cements can be applied to aluminum or any surface. They’re recommended where frequent removal is desirable or necessary. They’re recommended for application on electrical heating tracers (tapes). They’re recommended for refrigeration cooling coils to minus 116 degrees F (minus 80 degrees C). The maximum/minimum temperature range is between 300 degrees F and minus 116 degrees F (149 degrees C to minus 80 degrees C). The thermal conductivity is between 40 and 50 Btu in/hr/sq. ft/degree F. The U Range is between 20 and 40 Btu /hr/sq. ft/degree F.
The maximum/minimum temperature range is between 400 degrees F and minus 116 degrees F (150 degrees C and minus 80 degrees C). The thermal conductivity range is between 45 and 55 Btu in/hr/sq. ft/degree F. The U Range is between 20 and 40 Btu /hr/sq. ft/degree F.
The 4-foot long strip of flexible cement can be snapped over the tracer. Recommend a metal channel cover be applied over the strip of cement. Installation time may be reduced by 80 percent. This cement is soluble and therefore must be protected from moisture. The strip material is for straight run tubing (pipe) applications. It’s a flexible cement strip, applicable to the size tracers previously described. The tracer size must be specified when ordering. The maximum/minimum temperature range is between 400 degrees F and minus 80 degrees F (201 degrees F to minus 62 degrees C). The U Range is between 20 and 40 Btu /hr./sq. ft/degree F.
They’re recommended for all non-hardening cements applied to pipe tracers. They’re recommended for hardening cements to negate curing requirements and to afford protection from moisture. They provide extra mechanical protection for the tracer and heat transfer cement. They’re constructed of heavy gauge galvanized steel in 4 foot lengths. You should secure the metal cover with stainless steel bands at a maximum 18 inch centers. The channel covers are available with stainless steel banding and application tools. Specify the tracer size when ordering the channel covers. It’s a 10 inch schedule 40 horizontal pipe. The pipe temperature is to be maintained at 300 degrees F (possible still contents). Insulate with perlite silicate, 2 inches thick (3E Plus® economic thickness). Ambient low temperature is 0 degrees F.
Outdoor wind speed is 5 miles per hour (mph). It’s available at 150 – PSIG steam. Using the 3E Plus® 3.0 Program with the previously described data, the heat loss with 2 inches of perlite silicate insulation is 230 Btu/hr./lineal ft. for 10 inch pipe (10.75 inch outside diameter [O.D.]). Consideration must be given for oversize insulation to accommodate the tracer. Using the 3E program, determine the heat loss with 2 inches of perlite silicate insulation on a 12 inch pipe. The heat loss is 265 Btu/hr./lineal ft. Increasing the insulation thickness to 2-1/2 inches will reduce the heat loss to 225 Btu. 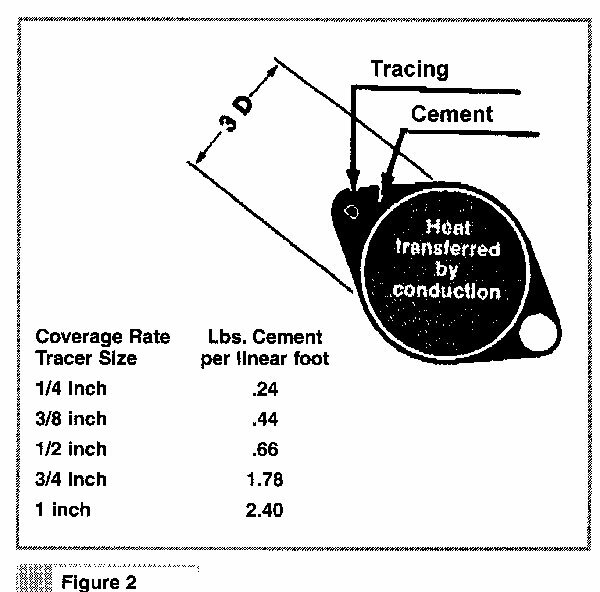 Let’s determine the tracer requirement without heat transfer cement (HTM)*. A single 0.750 inch O.D. tracer can only produce 20 Btu/hr./lineal feet of 150 lb. steam. To satisfy the 265 Btu heat loss, 265/20 equals 14, 3/4 inch tracers would be required or 4, 2-3/8 inch O.D. tracers. This is obviously impractical, even with increasing the insulation thickness. Now let’s evaluate the tracer requirement using hardening heat transfer cement*. 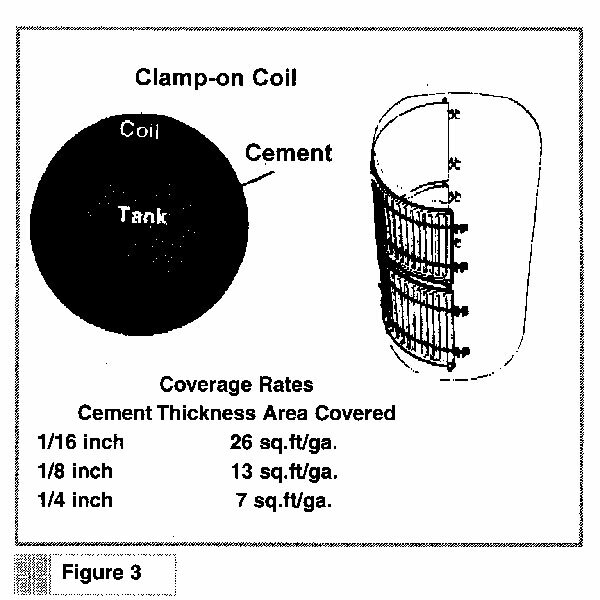 Hardening cement has a thermal conductivity of 90 Btu/hr./sq.ft./degree F. A single 0.625 inch O.D. tracer with hardening cement will supply 300 Btu/hr./lineal ft. This is greater than 265 Btu and therefore acceptable. 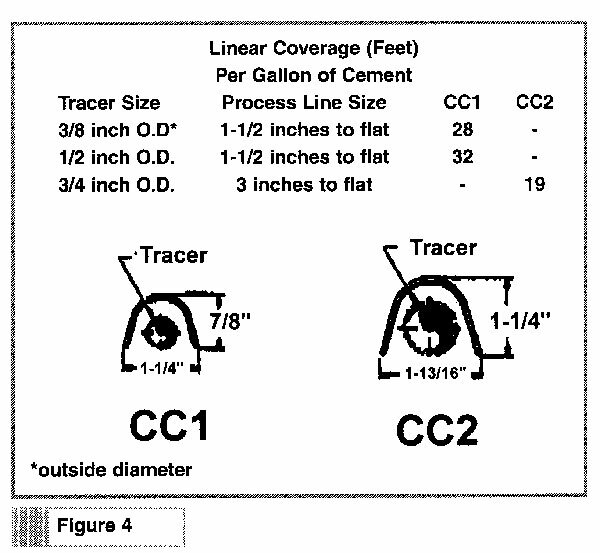 Finally, evaluate the tracer requirement using non-hardening heat transfer cement*. Non-hardening cement has a thermal conductivity of 55 Btu/hr./sq. ft./degree F. A single 0.750 inch O.D. tracer with non-hardening cement will supply 230 Btu/hr./lineal ft. This isn’t acceptable when insulated with 2 inches of insulation. However, increasing the insulation to 2-1/2 inches thick will reduce the heat loss to 225 Btu, as indicated previously. This design change would make it acceptable. Non-hardening cement is easier to install, doesn’t require curing, is waterproof, can be easily altered in the field with piping changes and is below the 400 degrees F temperature limit. Considering these advantages, non-hardening cement may be the correct choice. This information should indicate the important role heat transfer cements play in designing traced systems. Heat transfer cements provide many options and cost advantages. Without cements, there’s none. The maintained operating temperature, ambient temperature, resource of energy and the environmental conditions will determine the optimum heat transfer cement. This article was commissioned by CHEMAX Manufacturing Corp. Information about CHEMAX can be found at www.chemaxcorp.com.